The gold standard for galaxy classification among professional astronomers is of course the Hubble classification. With a few minor modifications, this classification has stood in place for almost 90 years. A description of the scheme which Hubble calls “a detailed formulation of a preliminary classification presented in an earlier paper” (an observatory circular published in 1922) can be found in his 1926 paper “Extragalactic Nebulae” which is pretty fun to have a look at. I should say that my choice of galaxies for the sequence owes a lot of credit to an excellent Figure illustrating galaxy morphologies in colour SDSS images which can be found in this article on Galaxy Morphology (arXiV link) written by Ron Buta from Alabama (Figure 48). I strongly recommend that article if you’re looking for a thorough history of galaxy morphology. Inspired by the “Create a Hubble Tuning Fork Diagram” activity provided by the Las Cumbres Observatory, I also provide below a blank version which you can fill in with your favourite Galaxy Zoo galaxies should you want to. I have to say though, the Las Cumbres version of the activity looks even more fun as they also talk you through how to make your own colour images of the galaxies to put on the diagram. Anyway I hope you like my new version of the diagram as much as I do. Thanks for reading, Karen. The latest release of data from the Sloan Digital Sky Survey happened yesterday (SDSS3 blog article about the release). This has been widely talked about as providing the largest ever digital image of the sky, but one thing which might have passed your notice is that as part of this data release your Galaxy Zoo classifications (from the first phase of Galaxy Zoo) have been integrated into the SDSS public database (CasJobs). This will make GZ1 classifications all that more accessible for professional (and amateur?) astronomers to use in their research, and we hope to see some exciting and novel new uses coming out. I’ll finish by including this visualization of the SDSS3 imaging data made by Mike Blanton and David Hogg (OK so I can’t work out how to embedd a YouTube video here, so here’s the link!). In many ways, the team here at Galaxy Zoo are freeloaders, making the most (with your help) of the hard work of the astronomers who work hard for years to design, build and operate the telescopes that produce the images for us to classify. The project’s first two incarnations were based entirely on images from the Sloan Digital Sky Survey, the star of A Grand Bold Thing, a book that was released this week. My book on the Sloan Digital Sky Survey — the source of those galaxies in Galaxy Zoo and the mergers in Galaxy Zoo Mergers — came out yesterday. The Sloan was, and still is, the only systematic, beautifully-calibrated survey of the sky and everything in it. And it’s the first survey to be digital, that is, log on to the website and download galaxies. Before the Sloan, cosmology was fractured into many fields whose relation to each other wasn’t obvious and wasn’t being studied. Sloan found all kinds of things in all areas of astronomy: asteroids in whole families, stars that had only been theories, star streams around the Milky Way, the era when quasars were born, the evolution of galaxies, the structure of the universe on the large scale, and compelling evidence for dark energy. Now, after the Sloan, cosmologists are beginning to see the universe as a whole, as a single system with parts that interact and evolve. A Grand and Bold Thing is about the very human scientists who built the survey: people doing their best, screwing up anyway, fixing it, screwing up again, running into trouble with the young folks, running into trouble with the money, getting their feelings hurt, forming hostile camps, and managing the unintended consequences of their best intentions. But they never give up, they’re astonishingly stubborn, they just keep at it until they’ve done it. of the University of Washington said in the blog, Cosmic Variance, about the Sloan, “You take good data, you let smart people work with it, and you’ll get science you never anticipated.” Some of that science is being done by the good people of the Zooniverse. Surveys open to the public have always been high altruism. I think the Sloan is still surprising. This object has the imaginative name SDSS J142005.59+530036.7. 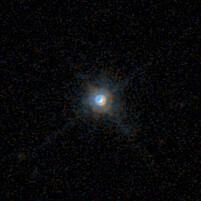 It lurks in the Bootes constellation and although it looks like a star, it’s actually a Quasar 15.3 billion light years away from earth going by its redshift. I have a love for Quasars, so I couldn’t resist this one in Budgieye’s OOTD posted on the 6th of July! In the heart of this galaxy lies a super massive black hole like most other galaxies. This particular one is an AGN, an Active Galactic Nucleus. AGN are super massive black holes in the centres of galaxies that are pulling in material from around them such as stars and gas. This material gets pulled into a ring doughnut shaped accretion disk around the black hole, and as this material swirls round it causes friction, releasing radiation out into the galaxy. The centres of these galaxies can be so energetic that they can outshine the galaxy itself; hence all you can see in the picture above is a star-like object- the nucleus of the galaxy. This energy can also be concentrated into jets of high energy plasma racing out at near to the speed of light for thousands of light years from the poles of the black hole, and depending on how these jets are positioned in relation to us the galaxy the AGN is lurking in can be called radio galaxies, Blazars, Seyferts and so on. In this case it’s a Quasar, so the jet is positioned so that it’s not quite beaming directly at us. Here’s a great OOTD by Fluffyporcupine on AGN! This week’s OOTW features this object (below) from Tsering’s OotD posted on the 26th of June. 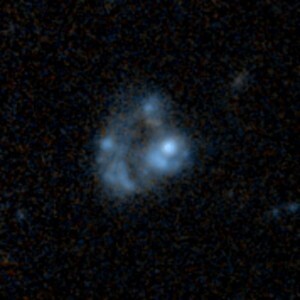 This is AHZ30000yv, a wonderful collisional ring galaxy! I love seeing the huge differences between the SDSS and Hubble images, the reason why Hubble can see more is because it’s out of the way of the Earth’s atmosphere, so even though Hubble is actually smaller than the the Sloan telescope (Hubble’s mirror is 2.4 meters and the Sloan telescope’s mirror is 2.5) it can see further, taking us visually back to when the universe was around half its current age and making me very happy indeed! This ring galaxy has a Z (redshift) of 1.432, so we’re seeing it as it was 9.15 billion years ago, just under 5 billion years after the big bang! So how did this galaxy end up as a collisional ring? The ring formed after another smaller galaxy punched through the centre of the galaxy, creating masses of hot young blue stars in the process through all the gravitational disruption. It is fun looking at the difference. There must be lots of UV light coming from it, otherwise nothing would be visible at all on SDSS. At that distance, the ordinary blue light from the stars would be redshifted off the limits of the SDSS detector for far red light. 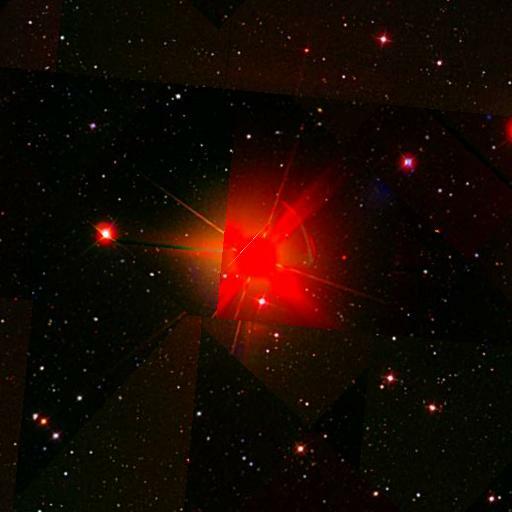 80 Cet, a star posted by Zooite and moderator Infinity on Sunday 20th June 2010 for Father’s Day, is in fact locked gravitationally to another star, both orbiting around each other on their common centre of mass. Interestingly, around one in three stars in our galaxy are found in binary or multiple star systems. I couldn’t glean much information on the stars but with the help of SIMBAD and Peter Clark (@lightbulb500) from the Young Astronomers website, we both agreed that it’s likely to be a Red Giant paired with a White Dwarf star -please point out if we have the classification wrong! Sources: Wikipedia and Binary Stars Blitzed. The original Galaxy Zoo and Galaxy Zoo 2 both used data from the Sloan Digital Sky Survey and recently, after reaching 60,000,000 classifications those projects began to wind down. The timing is excellent though and it allows Galaxy Zoo: Hubble to launch today, for the 20th anniversary of the space telescope. Images of galaxies taken using the legendary space telescope are there for everyone to classify and I recommend that you go and do just that. A lot of the fainter galaxies look like those seen in the Sloan catalogue from Galaxy Zoo 2 (this is a good sign, since we don’t want galaxies to change wildly depending on what telescopes we use!) however in amongst these there are some real gems to be discovered in the Galaxy zoo: Hubble data. I just found a couple in my first tentative classifications, I’ve shown them here to whet your appetites. Hubble has now been in orbit for 20 years. In that time it has helped us to understand the age of the Universe, to see more distant galaxies than ever before, to detect the presence of black holes in the centre of galaxies, to witness a comet collide with Jupiter, and much more! 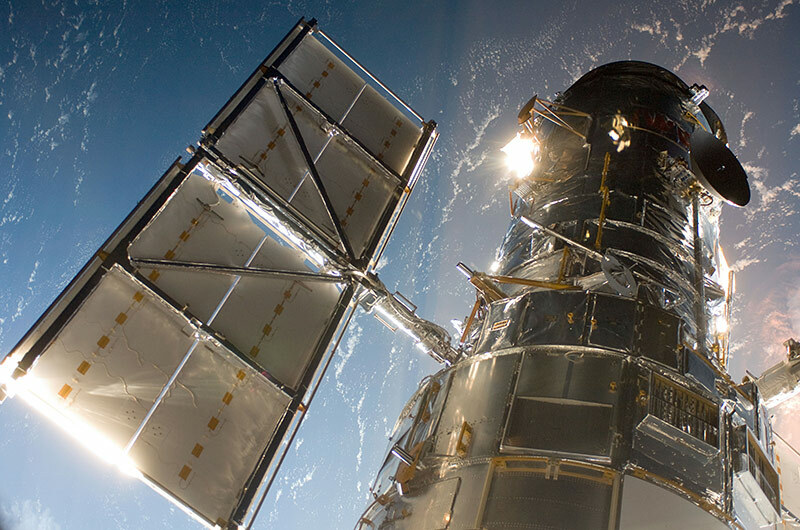 Hubble has captured the imagination of people all around the world and it has given us some of the most iconic images of space that exists in the public consciousness. The image at the top of this post was taken during Servicing Mission 4, just after the Space Shuttle Atlantis captured Hubble with its robotic arm in May 2009, beginning the mission to upgrade and repair the telescope. Thanks to that upgrade, Hubble will continue to provide amazing images and science for many years. So that’s enough chat from me – go and classify some Hubble galaxies! No, no one on the Zoo team has won the Nobel Prize. But there are interesting connection with the 2009 Physics prizes, just announced by the Swedish Academy. The prize was shared by Charles Kao, Willard Boyle, and Charles Smith. Kao’s work contributed greatly to making fiber optics feasible for reliable transmission of signals at high bandwidth, a prerequisite for the Internet as we know it today. And incidentally, optical fibers have multiplied the effectiveness of spectrographs for astronomical surveys, by letting us pipe light from hundreds of objects at once into a single spectrograph; this is how all the SDSS spectra examined by Zooites were obtained. Boyle and Smith shared the prize for their work in inventing charge-coupled devices. These are the electronic chips used for digital images, which have multiplied the reach of astronomical telescopes and worked their way into tens of millions of digital cameras. Compared to photographic emulsion, CCD chips are vastly more sensitive, can be calibrated more accurately, are reusable, and provide their output immediately in digital form for computer analysis or telemetry. Of course, the Sloan Digital Sky Survey made good use of these properties, with a mosaic of CCDs behind five different filters scanning the sky. Hmmmm. Data mapping the Universe, whose evaluation is shared among volunteers from the general public. That reminds me of something… At any rate, I think I can speak for the whole Zoo community in saying to Kao, Boyle, and Smith – congratulations, and a special vote of thanks!